And just over a week later, I had this to show! Oh my god, I’m so happy with it! I started questioning my sanity (as did my friends on Instagram) choosing to work with brown AND gold, but I persevered, and I can honestly say – I think I managed to make brown look good! I also put my October #aussieaurifilclub thread bundle to use, using the variegated #6728 to quilt diagonally. I tried hard to work from my stash, but truly, my brown stash was SO severely lacking that I made a trip to my local quilt store for a couple of prints, including the Pearl Bracelets. The quilt blocks are super simple to put together, and reminded me of the shape of a football, so was perfect for this quilt! 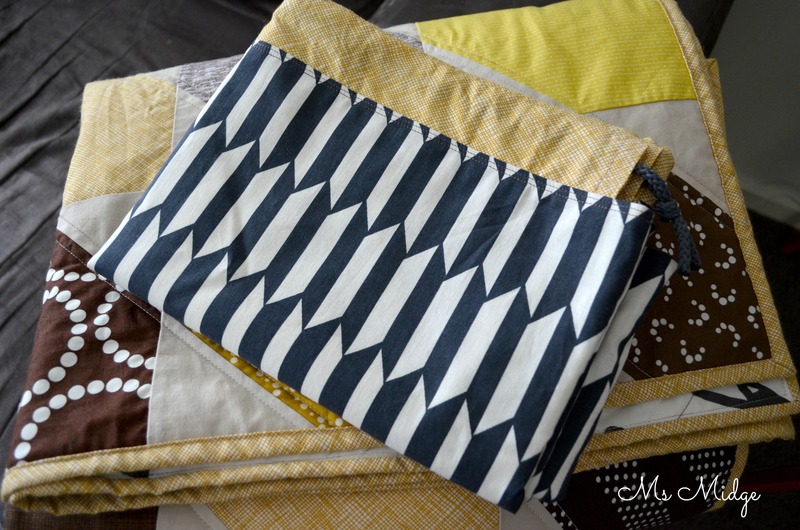 My lovely friend Alyce helped me out with the quilt math – because I needed 7.5″ blocks, to make the perfect 42″ x 70″ quilt. 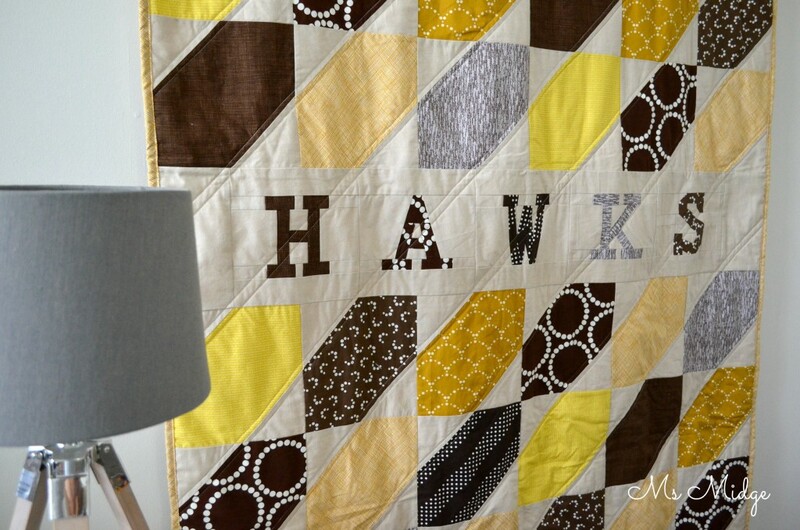 I also used my favourite paper pieced letters – Quiet Play’s Just My Type pattern – to spell out HAWKS! There’s plenty of Hawks inspiration around this household, I had no trouble at all for photography props hahaha! And to round out the request, I whipped up a laundry bag for Mr CB too. The laundry bags are required to be pretty distinctive, so members can find their own easily amongst all bags! I picked up this groovy black and white print from Lincraft last week, and am hoping it will stick out enough! And in breaking news – I printed on to fabric for the first time ever! I can honestly say I was pleasantly surprised when the fabric came out of my printer perfectly! I may have gasped! After asking on IG how to set the ink, I soaked it in vinegar for five minutes, rinsed and dried, then pressed. It worked beautifully. 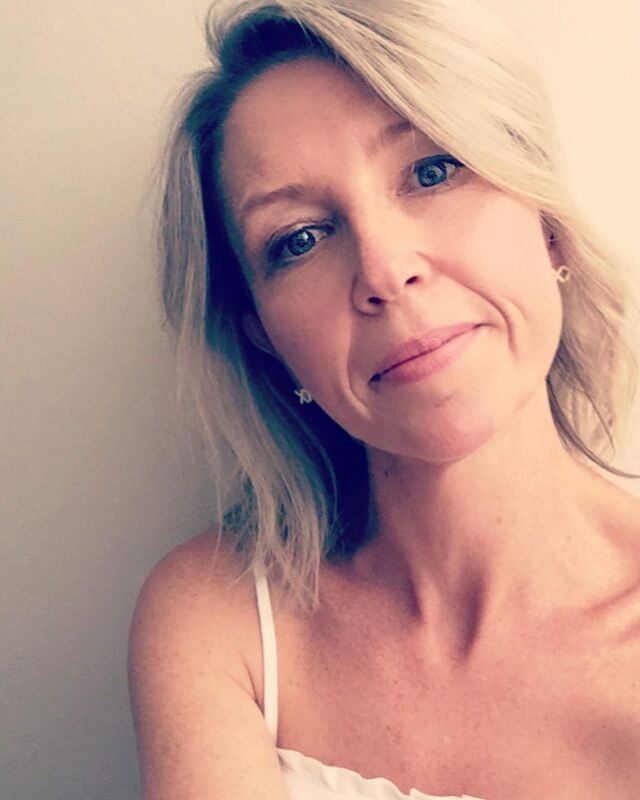 SO – here’s a challenge……. 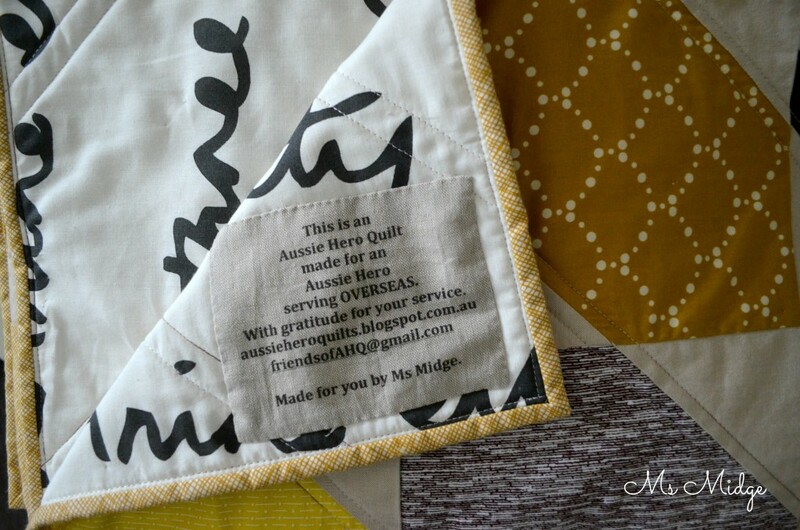 Next time you’re looking for a new project, or a charity to help out, why not check out Aussie Hero Quilts? I guarantee you will feel like you’re doing something great, and from all the feedback I have read online, the appreciation from recipients runs deep. We have SO many defence force members who would dearly love to receive a quilt and/or laundry bag, and I know JM would dearly love your help! You can find ALL the information here. Good for you Ms Midge! This quilt will delight and comfort the recipient for many years! And the label is the icing on the Hawthorn cake! 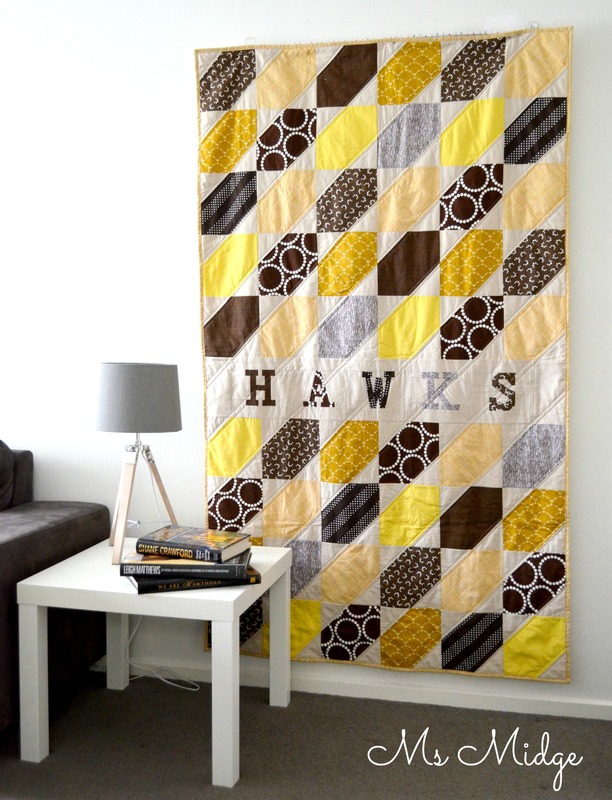 Yep – you did it – you made brown and gold both look great on an awesome looking quilt!!!! 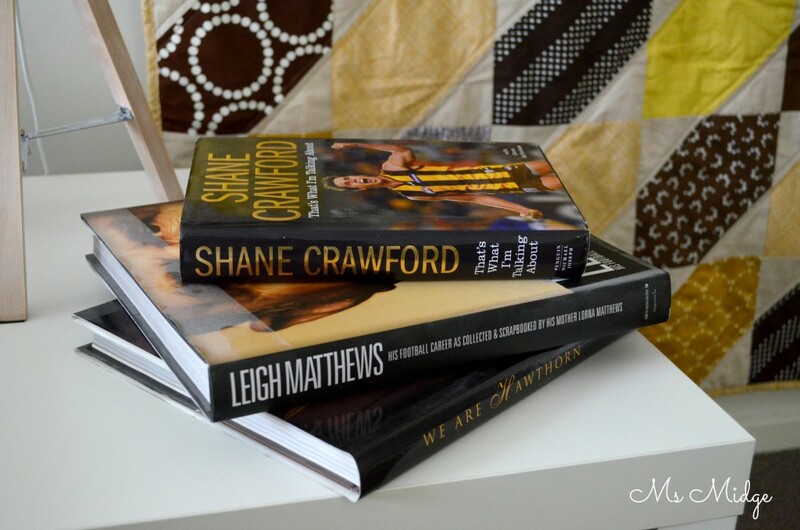 Well done – love Aussie Hero Quilts! haven’t managed a quilt for them yet, but did do some blocks for them last year! Fantastic quilt for a wonderful cause. I, too, have had the experience of creating a quilt or two for Aussie Hero Quilts. Knowing I am making a difference in the lives of our defence personnel in active duty… Keeps me sewing for AHQ.